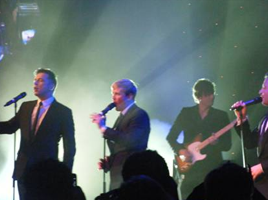 Boy band Westlife entertained guests at a gala dinner to celebrate the opening of the Convention Centre Dublin. The Convention Centre Dublin (CCD) opened yesterday after more than three years of development and construction. Westlife performed at the launch event last night, which was one of three events produced by Grass Roots to showcase the new centre. View pictures of the CCD launch here.